Last week saw the largest Summer NAMM show in six years, as members of the National Association of Music Merchants rolled into Nashville's Music City Center. With increased buying power spurred on by a bigger show footprint (a 5% increase in buyer attendance since 2013), the non-profit seeks to strengthen the music products industry. Increases in international attendance at NAMM and progressive educational offerings rounded out the up-tempo vibe. The number of buyers attending Summer NAMM increased another 5% over 2013. "NAMM members who attended Summer NAMM are leaving Nashville with a competitive edge to succeed in the second half of the year," said Joe Lamond, president and CEO of NAMM. "We are grateful to the members who shared their paths to success with their peers during breakfast sessions and the Top 100 Dealers Awards. Together we will continue to strengthen our industry." This year's Summer NAMM featured the most exhibiting companies since 2006. When the show opened, 438 exhibitors representing1,510 brands debuted new products. Adding to the energy were 103 first time exhibitors including Hang Over Guitar Straps, Blakhart Guitar Company, and Emerson Custom Guitars. The world's top music product retailers combed aisles searching for products that will boost fall and holiday sales. "There is a good mix of exhibitors and some beautiful products," said Brad Beavers of Mountain Top String Emporium in North Tazewell, VA. "I've done most of my buying for the rest of the year in the last two days." The number of buyers attending Summer NAMM increased another 5% over 2013. In total 12,442 people registered for the event. "You come here thinking you know what you'll find and you end up finding things you never knew you needed," said Jenn Ladd, co-owner of Bluedog Guitars of North Vancouver, B.C. "And then there are products and people here we just have to meet with to make that in person connection." Brands and buyers alike point out the benefit of building relationships through in person conversations and face time at Summer NAMM. "As a growing company without a huge sales team, we find that the five-minute conversations at the show can seal the deal for the rest of the year," said Ryan Cooper, regional sales manager for Cordoba Guitars. Leading retailers from Japan, Venezuela, Hong Kong, and Taiwan, and exhibitors from 12 countries including China, Sweden, and Germany added to the global business opportunities at Summer NAMM. Overall international attendance increased 19% over last year's event. "This is our first foray - our toe in the water - with an American show," said luthier Patrick James Eggle of Faith Guitars from the United Kingdom. "We're not just here to write orders, it's about getting exposure to the important American market. We already have generated some exciting word of mouth. It's a great introduction for us." 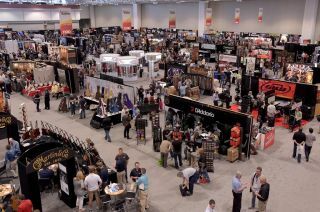 The exhibitor mix, similar to January's NAMM Show, reflected the full spectrum of music products including woodwinds, percussion, pro audio, recording, publishers and as to be expected in Nashville, a strong showing of fretted string instruments. Pro audio and technology driven exhibitors grew 23% filling up much of the expanded floor space. Perennially popular acoustic string instruments remain one of Summer NAMM's star attractions. Attendees crowded C.F. Martin & Co., Taylor Guitars, Gibson Brands, Cordoba Guitars, Deering Banjos, Eastman Guitars, Breedlove, Bedell and Weber Acoustic Instruments to strum the latest instruments. Just off the show floor, NAMM's new Acoustic Nation stage featured acoustic performances by dozens of artists including Jonathan Jackson and Enation, Greg Bates, a group of talented female singer/songwriters, The Ukedelics and more. The world's best retailers packed Davidson Ballroom Friday night for the Top 100 Dealer Awards. The industry celebrated excellence and innovation as host Ira Dean of the country trio Trick Pony awarded trophies in eight 'Best Of' categories. The Candyman Strings and Things of Santa Fe, New Mexico took home the Dealer of the Year award. Proprietors Rand and Cindy Cook graciously credited their peers in the music industry for their store's success. "We're just so very lucky to be in the business we are in," said Rand Cook. "Every six months we head to a NAMM Show and get lifted up by our peers. There's just nothing like our industry." An upbeat vibe carried throughout the invigorated summer show, leaving retailers and exhibitors optimistic for the second half of an already promising year. "Being here has really put the wind in our sails," said first-time exhibitor Derick White, co-founder Acoustas. "The show is a game changer for us."